A recent Harvard study of how employees communicate in open-plan offices seemed to signify the end of this workplace design trend. But, reports Fast Company, the study had an essential flaw. 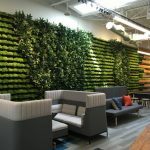 As the popularity of open plan offices continues to decline, Commercial Property Executive reports on the “neighborhood” design trend seen in many tech offices which are open, but zoned, allowing for some degree of privacy within a big space. Are offices getting smaller? Back in 2010, a typical office user had an average 225 square feet of workspace. By 2017, the average was downsized to just 151 square feet. Dallas News investigates. Propmodo argues that technology could finally help settle the open office debate.